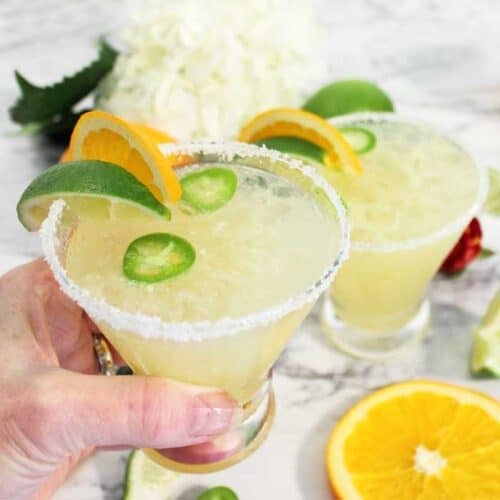 This Spicy Sparkling Citrus Margarita is not your standard margarita! 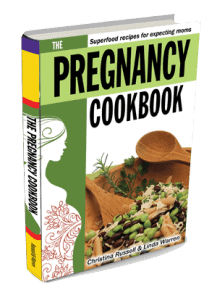 This baby adds a little heat to the lime and orange mix and loads of bubbles. 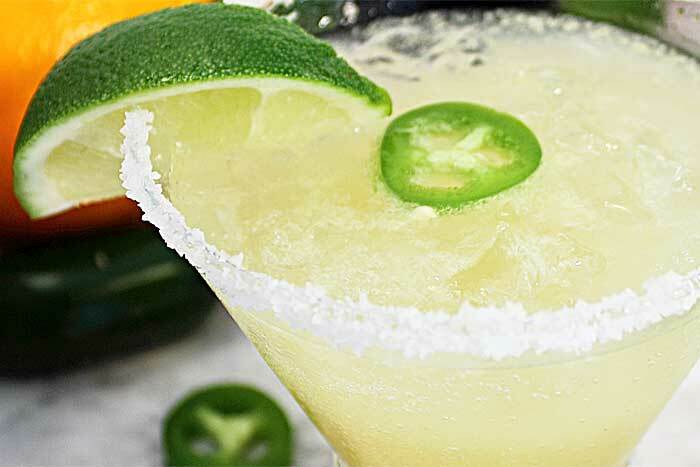 It’s a little bit tart and a little bit sweet cocktail with a kick from jalapeno slices. 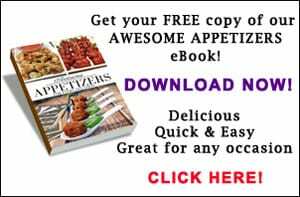 Perfect for the big game or your next party. What would the Super Bowl be without a few good cocktails? 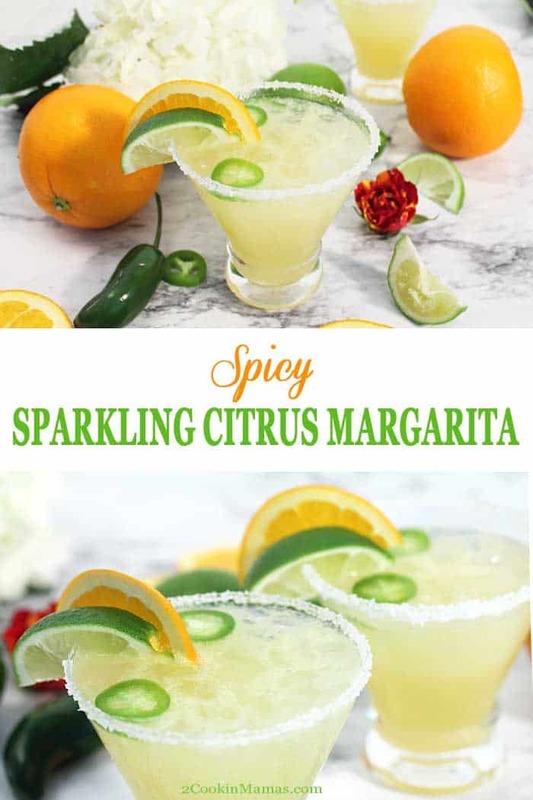 My new Spicy Sparkling Citrus Margarita has just the right amount of heat and sparkle to pair perfectly with all those deliciously addictive appetizers! I was experimenting with some new combinations for margaritas, which was a lot of fun and giggles, and thought one with a little kick and a few bubbles would be something a little different. 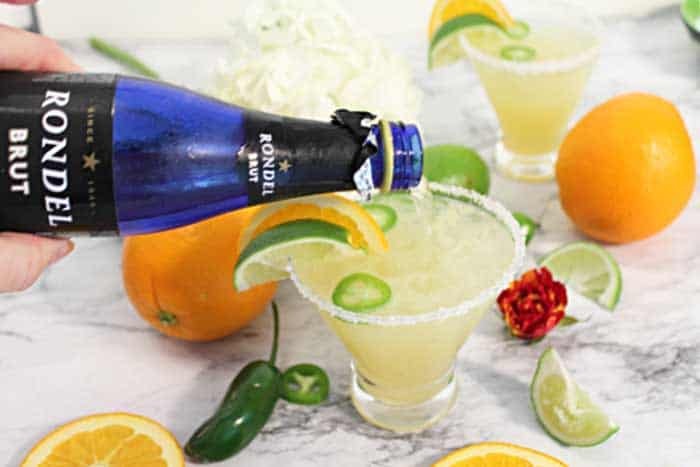 I’ve made regular Margaritas, Strawberry Lemonade Margaritas and White Christmas Margaritas so I thought a little kick of jalapeno and some champagne or sparkling wine might liven things up. Keep your friends close and your margaritas closer! I don’t know about you, but when I’m eating appetizers like Chicken Wings, Candied Bacon Wrapped Smokies and Spicy Mexican Cheese Dip, a tart and bubbly drink tastes mighty good. 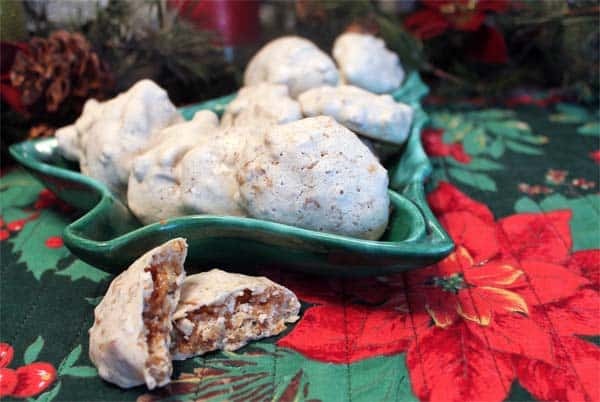 And this one is super easy to make. 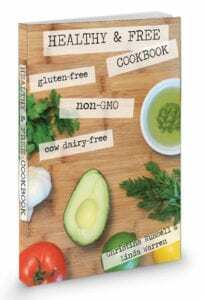 No special liquors or juices needed. In a cocktail shaker, add tequila, Grand Marnier, lime juice, orange juice and, if using, a teaspoon of agave nectar. Add a slice to two of jalapenos, with or without the seeds, depending on how much heat you prefer. 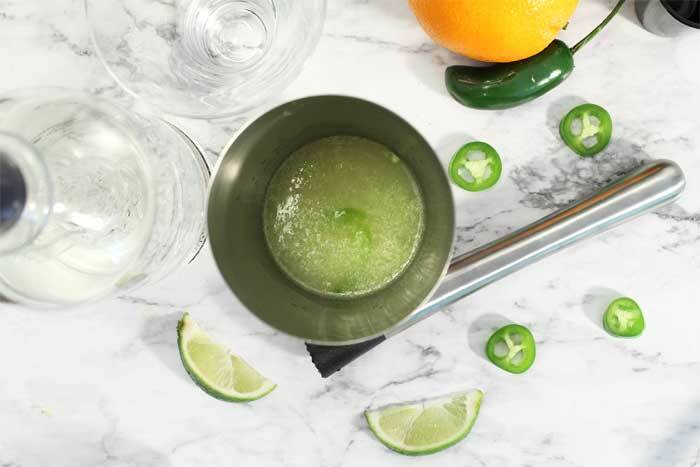 Prepare glasses by rubbing rims with a wedge of lime and dipping into coarse salt. Fill with crushed ice then strain cocktail mixture and pour into 2 glasses. Top each glass with sparkling wine. 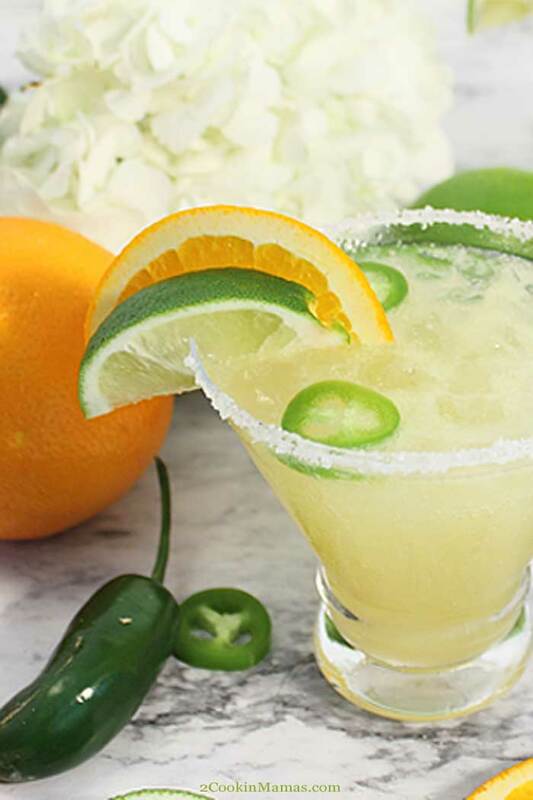 Garnish glasses with a lime and half an orange slice and a few slices of jalapeno. This cocktail is very adaptable too. 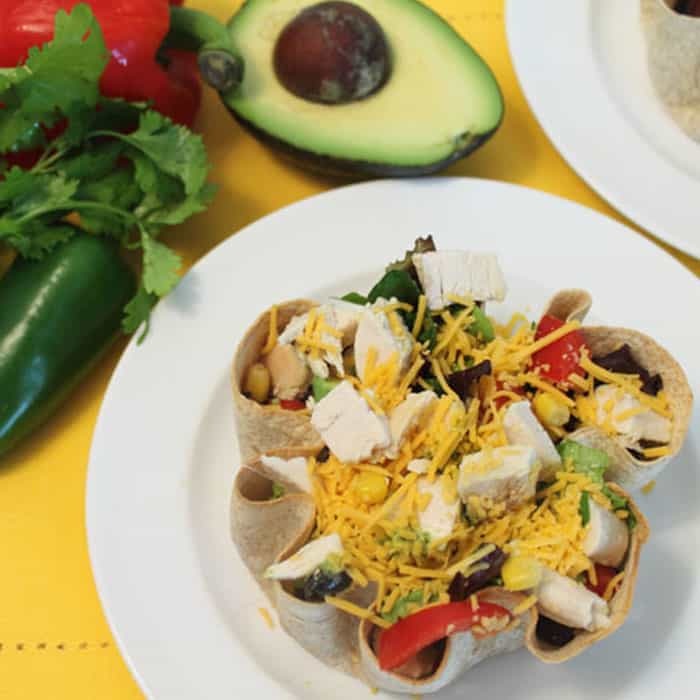 Don’t like the heat, leave out the jalapeno or tone it down by just using a small piece. 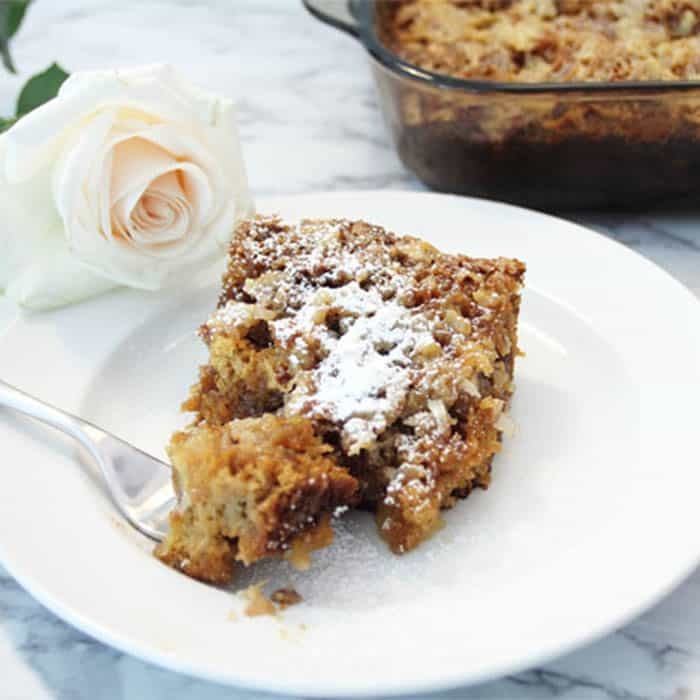 Like your drinks a little sweeter, add some agave nectar. Don’t like sparkling wine, switch it out for lime or orange sparkling water or club soda. Whatever way you like your cocktail, just sit back, relax and root for the best team to win. My team didn’t make it so I’m on the fence for which team to back. No worries though, I know I’ll enjoy all the food and drinks, the great company, as well as the half time show and commercials. 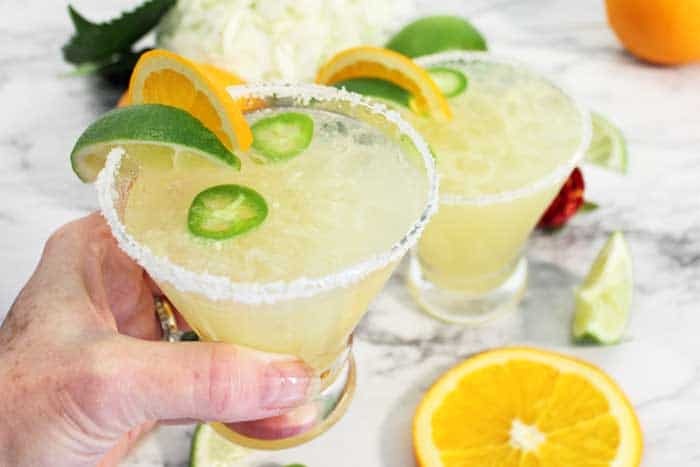 This Spicy Sparkling Citrus Margarita is a bit tart,a bit sweet, with a kick from jalapeno and a sparkle from champagne. Perfect for the big game. In a cocktail shaker, combine tequila, Grand Marnier, lime juice, orange juice and, if using, a teaspoon of agave nectar. Add a slice to two of jalapenos, with or without the seeds, depending on how much heat you prefer. Muddle these together. 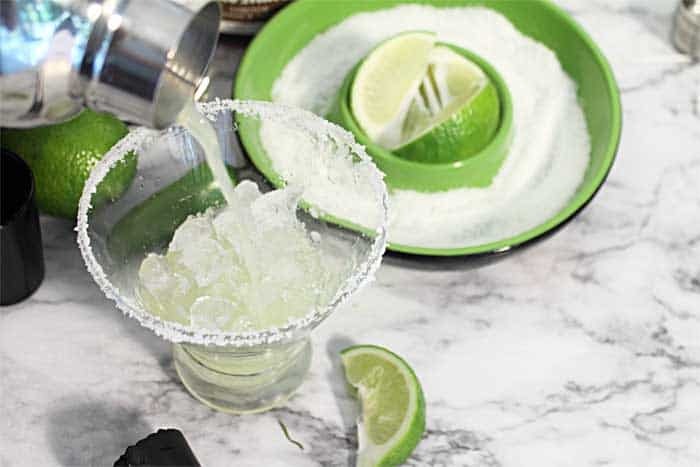 Prepare glasses by rubbing rims with a wedge of lime and dipping into coarse salt. Strain cocktail mixture and divide between 2 glasses. Top each glass with sparkling wine or champagne. 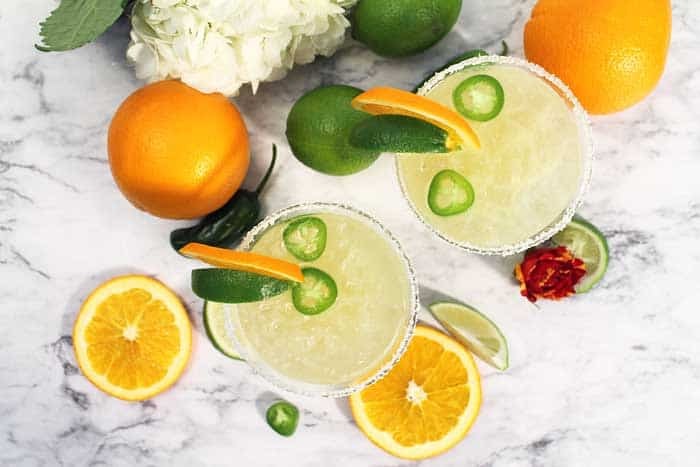 Garnish glasses with a lime and half an orange slice and a few slices of jalapeno. In a cocktail shaker, combine tequila, Grand Marnier, lime juice, orange juice and, if using, a teaspoon of agave nectar. Add a slice to two of jalapenos, with or without the seeds, depending on how much heat you prefer. Muddle these together. 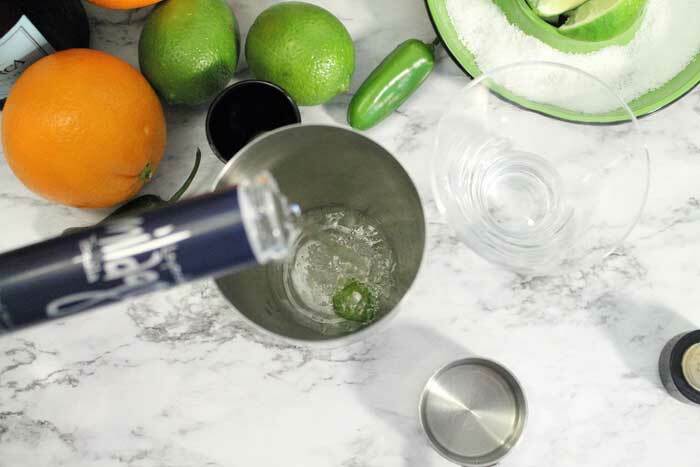 Prepare glasses by rubbing rims with a wedge of lime and dipping into coarse salt. Fill with crushed ice. Strain cocktail mixture and divide between 2 glasses. Top each glass with sparkling wine or champagne. 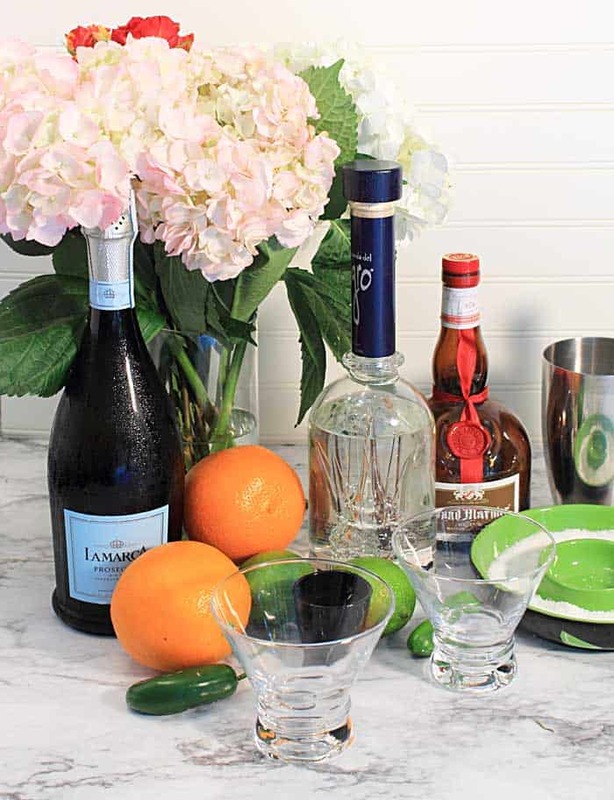 Garnish glasses with a lime and half an orange slice and a few slices of jalapeno. So great with the champagne! This is delicious.